Crime in Britain, part 3: emergency calls | Notes from the U.K. Ever wonder what it’s like handling emergency calls? You know, the pressure, the life-and-death situations, the idiot who calls because a parking meter ate his change? Okay, I made up the parking meter, but the real stories are better. The Avon and Somerset Police took to Twitter in the hope that it would educate us about what the word emergency means. I’m not convinced it will, but it’s been fun. For all I know, they weren’t hoping to change things but just wanted to keep themselves amused. Anyway, since I’ve been writing about the serious side of crime lately, I thought I’d let you know what emergency calls are like before I move on to some other topic. Let’s start with the man who reported being chased by a vicious badger. He dangled his keys at it and scared it away, he said, and he wasn’t sure where it had gone but he thought maybe someone ought to know about it. Just to put it on record, I guess, so in case it attacked again it would have a prior—well, not conviction exactly. Convictions are only possible if you’re human, so let’s just say something vaguely related to a prior conviction. Relevant photo. I couldn’t help myself. 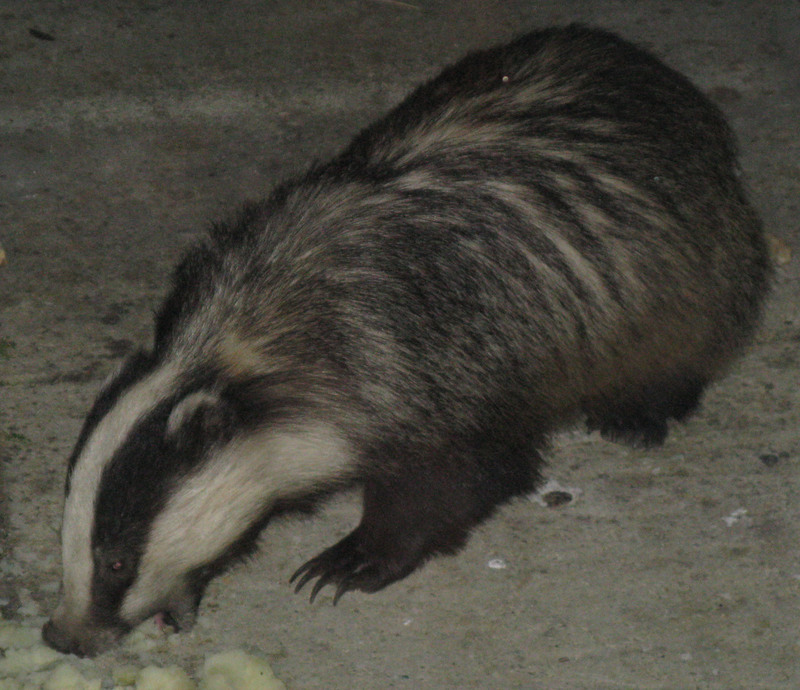 I had no idea what a badger looked like before I moved here, so I thought I ought to toss one in. This is from Wikimedia, taken by Prosthetic Head, and don’t ask me what that means. I’m only repeating what the data says. It’s scarier than the badger if you ask me. He and the call handler agreed that he should maybe call animal control, and that got him out of her hair. Then the story was tweeted (and probably press released), and both the BBC and the Western Morning News picked it up, and even though I’m adding my miniature noise to the uproar I do kind of feel sorry for the guy. Okay, moment of conscience over. What are the other calls like? A man called because a gull stole his sandwich, and a woman called because a guest house owner refused to cook her a breakfast. Let’s assume she was a guest there. A caller asked to speak to the queen. Someone reported being splashed by a puddle. That makes it sound like the puddle was the active agent, which means I could safely insert vicious, as in splashed by a vicious puddle. Someone else complained that a taxi seat belt was too tight. A man found a melon on his doorstep, cut into slices. That’s the melon, not the doorstep. A woman reported that Mary Berry kidnapped her. Mary Berry, for those of you who don’t live in the U.K., is a TV presenter. She bakes, and she’s neither young nor threatening looking. If she kidnapped you, you could expect cake and a nice cup of tea. You might, however, have to wear an apron and learn to use a whisk. But I’m getting sidetracked. A drunk asked for a ride home. A woman reported a wisp in her house. A man reported that his mobile phone provider was robbing him because he had no service. The police tweeted this kind of stuff for twenty-four hours at #ASP24, where you can still find it—or could last time I checked; I’m not sure how long these things hang around. There’s also some lovely insanity mixed into the general self-promotion if you go to @ASPoliceLIVE. I can’t put those in as links because Twitter links don’t work. Who knew that? Raise your hands please. Even before I knew that, though, I knew they’d wreck the sentence. And with that, I’ll wish you all a safe and happy weekend. Try not to call cops, the fire department, or an ambulance, no matter how vicious the puddles are where you live. This entry was posted in Other Stuff and tagged anglophile, Avon and Somerset police, Britain, crime in Britain, emergency services, England, humor by Ellen Hawley. Bookmark the permalink. 11:29 p.m: A caller was frightened by a “round, bright, white light shining through the trees.” It was the moon. It had been cloudy for so many nights running that the caller had forgotten it existed. on an unrelated note I just googled Mary Berry, I know who she is but I wanted to know what she did before she was a tv person…apparently she baked…anyway…Mary Berry’s website is blocked by me work Web admin under the category Religion!! I just thought I would share that with you, despite it being not entirely relevant! Not relevant? Excuse me, but if that’s not relevant, what is? But I’m fascinated with the idea that your work computer lets you know why something’s blocked. And that its reasoning is so–um, interesting. woohoo I was relevant!! ON a Friday morning before coffee too! They do tell us why things are blocked and have some very odd categories and even odder websites that go into those categories!! What’s blocked and not blocked under what category would make a great blog post. Worth a try, though, don’t you think? If it turns into a rant, you can always file it in the rant section of your hard drive and not hit Publish. Okay I adapted that myself, but I think it still works. If we can just get the word out there, the converts will come pouring in. I mean, they’re out there already, worshiping in their own random ways, but they don’t know this is an organized thing, with, like, prayers and everything. Why thank you. I’ll do my best. I have a date with two kids and some ice cream this afternoon, which isn’t a bad start–especially considering that it’s not even the weekend yet. Oooh that sounds pretty good – I would declare the weekend early, if I were you! It really was a wisp. There was some kind of explanation of it as a supernatural phenomenon, which I promptly forgot the details of. Actually, being splashed by a motorist driving past through a puddle IS an offence. “Driving without due care and consideration…” I think is the charge. Not sure anyone has ever been prosecuted for it, though. I didn’t know that, but the wording didn’t involve a car, just a puddle. I’d assume a car was involved, but (in the spirit of keeping this as strange as possible) we have to work with what we’re told. Over here, the police do a bad job of publicizing the “non-emergency” numbers, so people call 911 for just about everything. It rained pretty hard last night, so I’ll be on the lookout for vicious puddles when I walk the dog. Badgers can be tough fighters. If you have vicious puddles, I can only imagine what your badgers are like. Good point about the non-emergency numbers. The emergency ones are short and easy to remember. The others? Are you kidding? As the for badgers, they grew up scrapping with those puddles, so yeah, they’re tough. The ones that survive, that is. You be careful out there with your dog. I dream of Mary Berry kidnapping me and making me a Victoria Sponge with a nice cup of tea. I suppose it would be rude to tell my kidnapper that I’m not a real fan of Victoria sponge but that I love carrot cake. She will probably teach you how to make a proper one. Hold on here. If I’m getting kidnapped, I expect the cake to be waiting for me. If I’m going to make my own, I can stay home. These made me laugh. But upon further introspection, I felt a little sad that so many humans are insufferably daft. It’s taken me the better part of 68 years to accept that we’re a difficult species. Apparently, rather than arming them with guns, UK police are armed by a sense of humor. Much better, in my opinion. Apologies for quoting from myself, but I did write a post about unarmed policing, based on a conversation with a retired British cop. He considers it much safer, which interested me. I use to work from a BT contact centre that took the emergency 999 calls and sat for a day with one of the operators. They regularly get calls from people who’ve lost their glasses or keys, and one who had a doctor’s appointment but couldn’t find the surgery. However, amongst all this were some very traumatic calls – a young person who had been abused and was totally distraught, an elderly lady who thought her husband was having a heart attack. It’s a heck of a job having to be calm when faced with despair. One of them told me how he helped deliver a baby over the phone – the woman giving birth on one end of the line, the paramedic on the other end giving instructions to the operator. The idiots do break up the tension – but they also take up a line someone else desperately needs to get through on. I never thought of the contribution the idiots would make by breaking the tension, but I can imagine that after a traumatic call you’d just want to slap someone who was wasting your time. I can confirm that puddles can most certainly be vicious. Especially American puddles which tend to be armed with guns that they stole from law-abiding citizens. Wow. I’ve been gone a long time. It wasn’t like that yet when I lived there. Back to that being kidnapped by Mary Berry. If that were to happen, what kind of treats might a fellow expect? If I bring my own manly apron, can I wear it or must I wear what is provided? These questions are critical to whether I put up a fight. I saw a photo somewhere recently that left me believing the aprons are pretty much gender neutral. That was before the kidnap scenario came up or I’d have paid more attention. But in any case I don’t think it’s reasonable to ask a kidnappee to bring his or her own apron. How do you know this stuff? Or maybe the question is, How did I manage to arrive at the age of 68 and not know it? Oh, I am a mine of useless information! That’s a surprisingly useful (not to mention entertaining) thing to be. I’m thinking of calling 911 because our temps are approaching triple digits. NOT supposed to happen this close to the coast. Somebody needs to DO something about that before I melt. Yes. Pick up that phone. Now I know why I refuse to have Twitter on my smartphone! There was a hilarious consumer complaint call from a middle-aged Memphis woman who summoned police to retrieve $25 from a drug dealer who had sold her some very poor quality crack cocaine. She wasn’t high or deranged – she spoke to the incredulous dispatcher with the aggrieved certainty of one who has been wronged, as in tricked into buying a damaged car tire or ten pounds of bad beef. She gave the 911 operator her address without the slightest hesitation, and urged him to send a squad car ASAP before the dealer had a chance to get far. The camera focused on one of the neighbors, a fashionable young man with neat braids and elegant baggy pants. He just shook his head. He shook his head again and walked away. Okay, I am now officially speechless. That’s–um. That’s–. Amazing‘s going to have to do, although it doesn’t come close do doing it justice. 1) This was her brain’s very rare way of experiencing the fulll-blown delusions common to all crack users. 2) I didn’t see the intro and this was footage of a practical joke. I don’t doubt it’s true. But, uh, gee, where do we start in discussing the strangeness? Or maybe a Google survey? I spent a lot of time with my nose pressed to the front window of New York subway trains. I don’t really know what I saw–tracks, lights, motion, blurred bits of myself–but it was absorbing. I think I’d rather like a wisp in my house. It might keep the cats entertained. Reading that, though, made Brit-radar sigh with satisfaction. If I could schedule the wisp for 7 a.m., when the kitten needs entertaining, that would be great. What happens at the moment is that he starts dancing on my head. Up! Up! Time to play! Exactly. And now that I’m up and at my computer (8 a.m.) he’s asleep on my knees. A couple of nights ago I thought I’d be prepared and took the squirt bottle to bed. In the morning when he started dancing, I took hold of it and squirted myself full in the face. The sleeping kitten on the knees, yes. The squirt in the face? I could’ve done without that. Although it did mean I was fully awake all of a sudden. They’re funny, funny people, aren’t they? Those are some ridiculous calls the emergency line gets. Bird stole a man’s sandwich and she thought it appropriate, unbelievable. He could have just got another sandwich which couldn’t have been that difficult. Now if the bird had stolen a man’s cake, I think we can all agree that it would be a more serious situation. Nobody, nobody steals cake! :D Probably why we don’t hear of cake theft in the news too often, at least in Australia. Nobody steals cake? That probably tells us it’s too well guarded. Thank Horatio for his comments and tell him I’m glad he has someplace warm and safe to live. I have some fine fat worms in the compost heap, and as soon as I figure out how to get them into an attachment I’ll email him some. I’m right about hedgehogs and worms, aren’t I? “Aren’t I” is a weird bit of grammatical oddity, aren’t it? But “am I not” is ridiculous. You’re Horatio’s hero. Worms are his favorite treat. Oh, my. I always wanted to be someone’s hero. I never thought it would be a hedgehogs, but that only makes it better. Pingback: Dealing with the public, U.K. style | Notes from the U.K.